Tired of your old bathroom faucet? Maybe it came with the house and you never got around to replacing it, or maybe you just think that it is time to replace it. While some people may think that it is a challenge replacing a leaky or outdated faucet isn’t always as difficult as you may think. You can easily tackle the project with a basin wrench and a few other common tools. Usually, it will only take about an hour. The same steps will apply if you are installing a new faucet onto a new sink. Step 1: Turn off the water supply. The valves are typically under the sink. If not, turn the water off at the main valve. Then turn on the faucet to relieve any water pressure left in the lines. Step 2: Disconnect the supply lines from the faucet. Use a basin wrench if you can’t reach the connections with your hands. Step 3: Disconnect the lift rod, and then remove the nuts from under the faucet. Step 4: Unscrew the slip nut on the P-trap. Put a bucket underneath to catch water in the trap. Step 5: Disconnect the drain flange from the tailpiece. It should unscrew. Step 6: Clean around the old drain and faucet holes. Mineral spirits can help to remove old silicone sealant. Step 7: Follow the manufacturer’s directions for specific installation instructions. Most installations begin with installing the gasket on the bottom of the faucet. Some require sealant of plumber’s putty. Then put the faucet through the mounting holes in the sink and tighten the mounting nuts. Step 8: Not all faucets come preassembled, so you may have to attach the handles. It is relatively easy. Slip the guide ring onto the bottom of the handle, position it on the faucet base, and secure with the setscrew. A setscrew is the tiny screw on the underside of the handle. Your faucet probably came with a hex wrench to tighten it. Step 9: Next move onto the drain. Screw the nut all the way down on the drain body and push the gasket over it. Some gaskets are threaded and simply screw into place. Step 10: Apply just a little bit of silicone under the flange. Position the drain body on the bottom of the sink- making sure the pivot hole is facing the back- and screw the flange on from the top side. Step 11: Underneath, tighten the nut and gasket. On the top, use mineral spirits to clean up and excess silicone. Step 12: Install the drain rod next. Unscrew the pivot nut on the drain body, insert the horizontal rod through the hole in the stopper, and replace the nut. Push the horizontal rod down and secure the lift rod to the strap with the screw. Test the lift rod. Step 13: Reconnect the supply lines to the faucet. If your sink is already in place, use a basin wrench to reach the faucet shanks. Step 14: Flush the faucet by removing the aerator. This gets rid of debris or sediment in the faucet. Some faucets include a handy little tool to unscrew the aerator. When you’re done, keep it inside your vanity or with the rest of your tools. Turn on the hot and cold water for about a minute. Check all of the connections for leaks and retighten if necessary. Screw the aerator back on and you are done. Expecting guests over the holidays? There’s no better time to give your guest bath makeover, and a new faucet is a perfect place to start. Surprisingly, it’s simpler than you think. From start to finish, it can be completed in one afternoon. You’ll spend more time shopping for the perfect fixture than actually installing it. 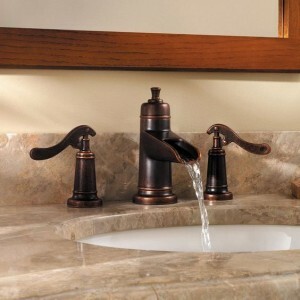 A faucet can either be plain and go un-noticed in a rooms decor, or it can stand out and be the focal point of the space. 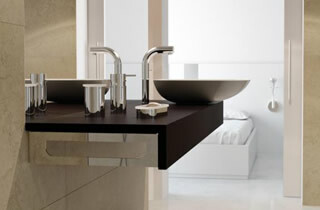 Plumbtile offeres hundreds of faucet options to choose your ideal style and finish. Whether you are looking to upgrade your bathroom or kitchen faucet, you can be sure to get exactly what you want. 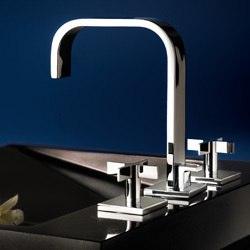 California Faucets also allows you to customize your faucet to your preferred style.